It's October, which means it's that time of year where our family is pretty excited to be getting ready for Halloween! It's definitely a top family holiday. 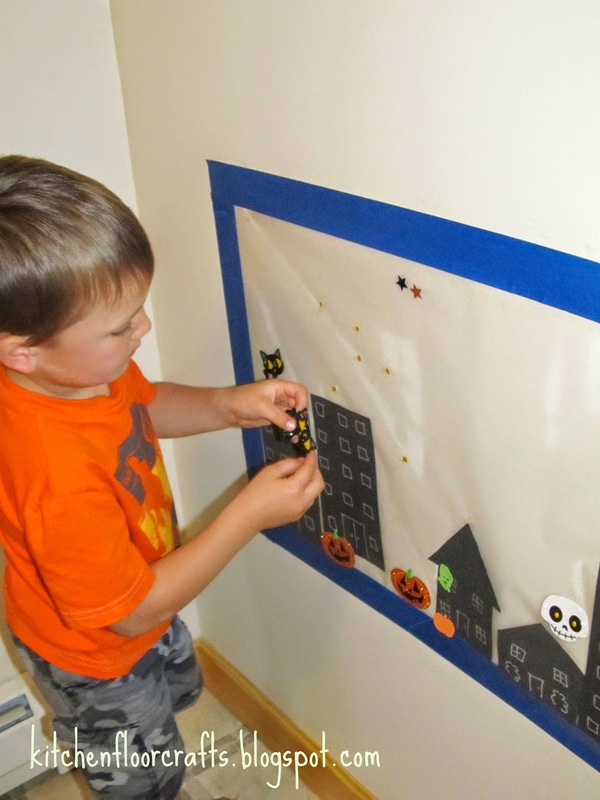 This year we were excited to participate in the Halloween Read + Play blog hop. Over 25 bloggers each picked a favorite halloween book and have paired it with a fun activity or project, there are some great ideas in this series! For our project we chose the book Pumpkin Eye by Denise Fleming. The story is filled with fabulous rhymes, a catchy rhythm, and helps the reader imagine they're on the street trick-or-treating for the evening. 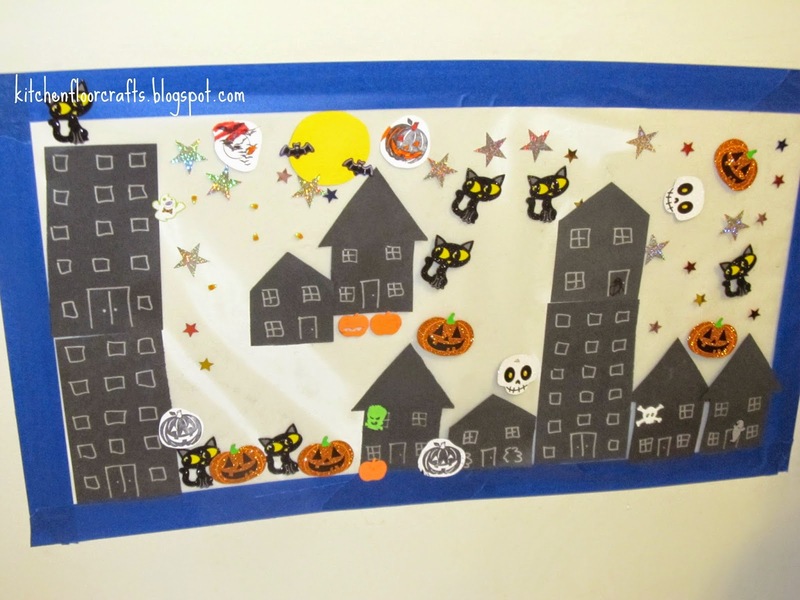 After we read the book, we created our own halloween street using the "sticky collage" approach. We call it a sticky collage because the base is contact paper, which allows little hands to stick the items to the collage without needing glue. We've enjoyed several other types of sticky collage before. Before the boys got to work I gathered some collage materials. 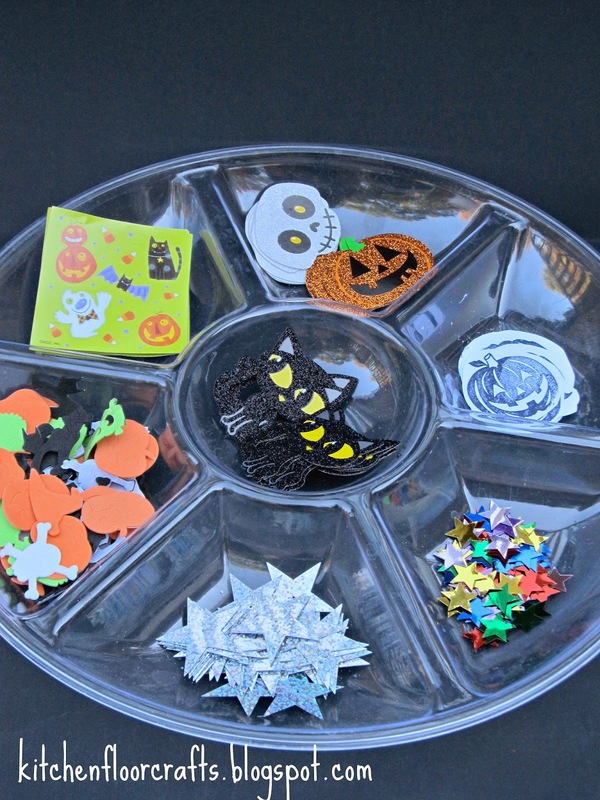 Materials included foam halloween stickers, some sparkly halloween confetti, stickers, star sequins, and some pre-stamped images I had cut out. 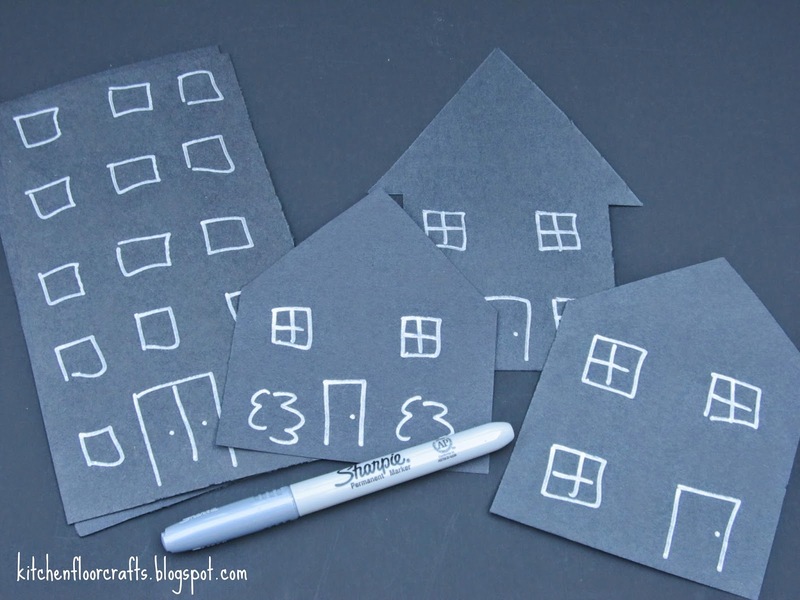 I also created some buildings using black construction paper and silver permanent marker to match the images of the buildings in the book. I usually use painter's tape to hang the contact paper onto the wall so that it will stay up for both the adding and taking away from the collage. We read the book and then as soon as the boys saw the tray of materials they eagerly got started on their collage. Big Brother was a little more purposeful in his layout and planning of the street. Little Brother was a little more random in his additions, but really enjoyed putting some of the larger pieces onto the collage. Big Brother went back to the book and added some more elements from the story, although he was particularly concerned about how we would get trick-or-treaters on the street. He decided to draw a few onto the buildings. 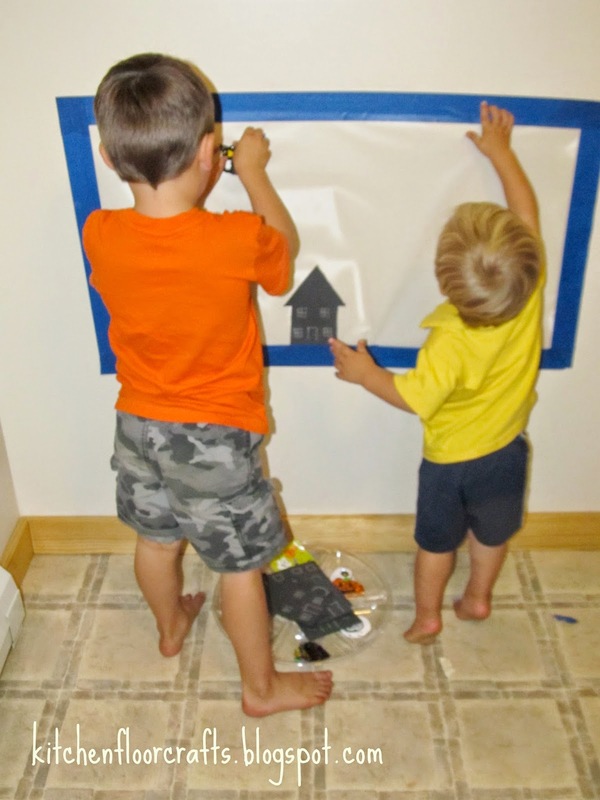 We currently have the first collage we created hanging on our playroom wall. But Big Brother asked to work on another one, which he's been slowly adding to all week. We're looking forward to adding to the materials tray as the month goes on. 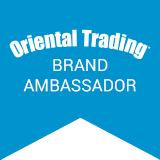 Looking for some materials of your own? 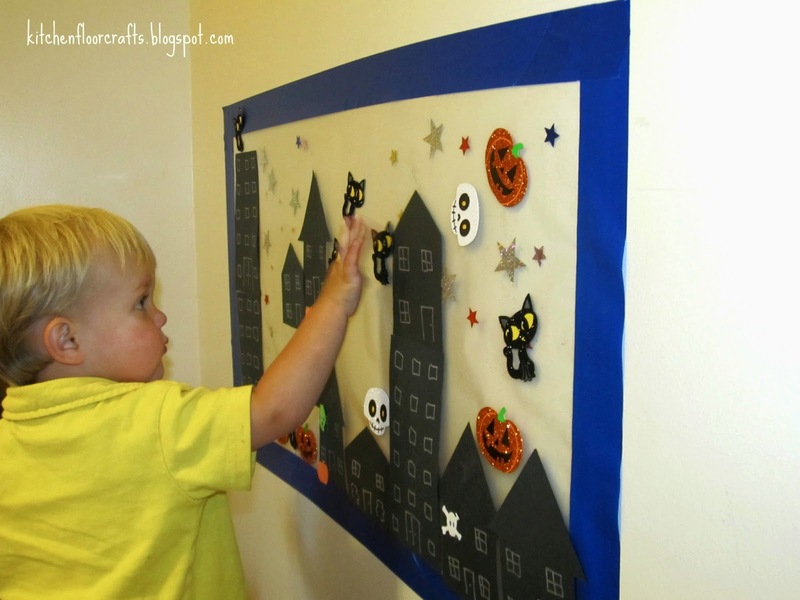 Check out these great resources you can add to your own Halloween collages. And don't forget to check out these other great posts from all the other bloggers involved in the Halloween Read + Play! !